Good. no damage or restoration. Some wear to the decoration. 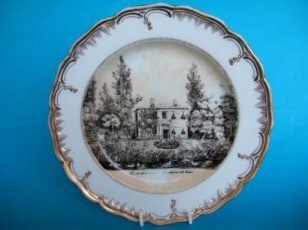 A Vienna Porcelain Plate. c.1780. 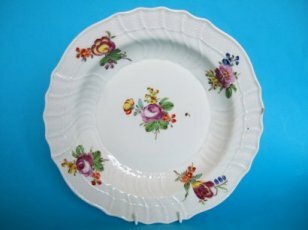 A very nice Vienna porcelain ozier moulded soup plate dating from the last quarter of the 18th.Century. Painted in bright polychrome enamels with five colourful flower groups. Marked with Vienna factory shield mark in underglaze blue, a painters mark in enamel alongside the factory mark. Measures 25cm. (9.8 inches) diameter. One small chip to the rim and a little wear to the decoration. 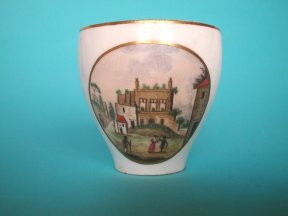 A Naples Coffee Cup c.1790. A rare Naples soft paste porcelain coffee cup of unusual shape. Painted with a Neapolitan townscape in polychrome enamels. Note the smoking Mount Vesuvio, centre right in the picture. The Volcano was very active in the late 18th.Century. The cup stands 7.5cm. high. Marked with a crowned 'N' in underglaze blue. Unfortunately there are two small rim chips, no cracks. No restoration. A Meissen Cup & Saucer. 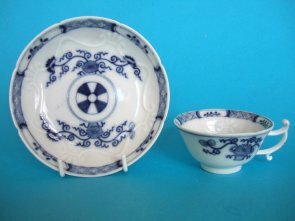 A rare Meissen underglaze blue decorated cup and saucer made around 1740 Lightly moulded anthemion design to the interior of both cup and saucer. Painted in underglaze blue with a pattern borrowed from Chinese export porcelain of the Kangxi period. Both pieces marked with underglaze blue crossed swords mark, impressed numerals and 'blue painters' marks to the inside of the footrim. Saucer measures 13cm. diameter. Cup measures 8.5cm. at the rim and 4cm. high.